The Download Map Tool allows you to create a quick map or image file for printing or offline view. It is useful if you have created drawings on the map and need a hard copy out in the field. 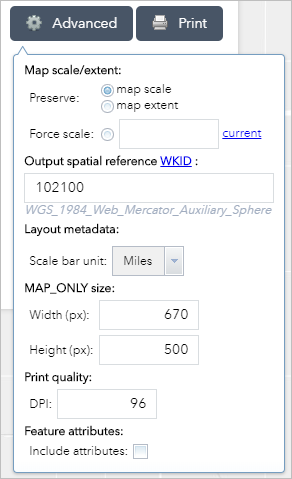 You can create a basic map or access the advanced options for scale, metadata and print quality settings. Enter a title for the map in the Map Title text box. The default reads 'Access Maps'. Note: The MAP_ONLY format prints only the map, omitting any marginal information from the output. The Map scale/extent section defines the method for calculating the printed extent of the map. Preserving map scale may cause the printed map to maintain its scale while recalculating the extent around the existing center point, while preserving the map extent may cause the scale to adjust to fit the current map extent into the printed map. You may also force a specific scale by checking the Force scale option and entering a scale. Click 'current' to populate the value with the present scale of the map. The Layout metadata allows you to override the default values set by the configuration. Enter values for the Author and Copyright fields. Check the Include legend check box to display the legend on the printed map. If the MAP_ONLY format is selected, you may provide dimensions for the Width and Height in pixels. Otherwise, these values are ignored. The Print quality section allows you to update the resolution of the printed map. Provide an updated value for the DPI (dots per inch) in the text box. Click 'Print' to create a file output for printing. A progress bar will display while your file is being created. When completed, select the file link. A new tab will open in your browser that contains your map/image. Save the map to your computer or print directly. Click 'Clear Prints' to clear the print history.